...Metaphorically speaking, to a certain degree, of course. But this short list includes a couple of locos, coaches, EMUs, and DMUs, none of which are currently allowed to mix with American mainline freight traffic. Given this equipment's global ubiquity, this points to a failure of the American regulatory body rather than a lack of safety inherent in the equipment. 10. Siemens EuroSprinter/EuroRunner (diesel variant). This piece of equipment is actually coming to our shores soon, as the Amtrak Cities Sprinter, but it has been in use as mainline freight and passenger equipment in practically every other country with standard gauge for decades now, and in fact is being phased out by Siemens in favor of a new product, the Vectron. In this case, the EuroSprinter represents not so much a single unit as a class of unit types, namely Europe's general-use diesels and electrics, such as Bombardier's TRAXX, Alstom's Prima, Vossloh's Euro, Voith's Maxima, EMD's Series 66, and Škoda's 109E, among others. 9. Bombardier VLocity 160. Victoria, Australia's, standard DMU. These trains operate a regional level in much the same fashion as the MPE-coach push-pull sets now standard in the U.S., but are far lighter and faster. Other than their rail gauge problem, Australian operating conditions are very similar to American ones--far more than Europe's--and as such Australian best practices and equipment may be American models--such as CountryLink's Xplorer or TransAdelaide's 3000 Class. 8. British Rail Mark III Coach. The coach of the British rail fleet. Its tough and highly durable monocoque design, combined with its double suspension, combine to make the coach exceedingly safe and comfortable. Too bad repressive FRA regulations prevent such an elegant design from being used on American rails, in favor of heavier, inferior designs. It also goes well with the Class 43 (see below), and is also the basis of a bunch of MU designs. 6. Alstom Pendolino. The standard European tilting-train EMU. Originally developed by Fiat, these trains are designed for high-speed operation on legacy track: they are, in other words, ideal for the Northeast Corridor, far more than the all-too-slow and not-really-tilting Acela. The New Pendolino is the most recent variant and is also in use in China, a country whose freight network, like Australia's, emulates American conditions. 5. Stadler GTW/FLIRT. Common European DMUs and EMUs. Despite their surprisingly common application in the U.S. (the River Line is one such example), these units are not FRA-compliant and are thus treated as light rail, despite their all-around utility elsewhere. Similar equipment includes Siemens' Desiro, Bombardier's AGC, Alstom's SNCF Class Z 26500, and Nederlandse Spoorwegen's VIRM. 4. British Rail Class 43. The oldest unit on this list, it's here because of one major reason: the fastest way to bring express passenger trains to the U.S. is simply to purchase express passenger trains that were designed for high-speed service on legacy unelectrified lines. Therefore, simply making these trains street legal and acquiring them as the (proposed) Super Express enters service would massively--and rapidly--improve American rail passenger service. And create demand for a domestic version, too. Heck, Australia did the same thing (pictured above). Caveat: Class 43s are designed to operate in conjunction with Mark III coaches (see above)--or Aussie-style Budds--or possibly with a Class 91 and/or a driving van trailer. 3. Talgo 350. Spain's native high-speed equipment, and one of the premier loco-hauled high-speed trainsets in the world (Talgo's Pendular system pre-empts distributed-power equipment). If the U.S. is ever to get a proper passenger service and passenger hierarchy, equipment such as this, Alstom's TGV Réseau, AnsaldoBreda's ETR 500, SJ's X2, or Rotem's KTX-II, would need to be allowable wherever service and merit demanded. 2. N700 Shinkansen. The only Japanese model on this list--and for good reason (bullet trains are Japan's only standard gauge trains)--the N700 is also built by all four of Japan's major rail builders (Kawasaki, Hitachi, Kinki Sharyo, and Nippon Sharyo) and is also the only Shinkansen model that has been exported (to China and Taiwan, respectively). Similar to this is Hitachi's Super Express program over in Britain, another model that needs to be street legal in the U.S. from Day 1. 1. Siemens Velaro. The high-speed rail gold standard, and has been for a decade now. The pioneer in distributed-traction trainsets, and still the fastest train in Europe, the Velaro represents a generational leap forward in European high-speed technology. Only now, with the Zefiro and AGV, are Bombardier and Alstom catching up with Siemens; Italian AnsaldoBreda and Spanish CAF now offer the less expensive V250 and HT65000; and Rotem and Talgo are busy at work creating the KTX-III and AVRIL. This is the forefront of global high-speed rail, and will be, short of another breakthrough being made. These ten pieces of equipment (and their competition and derivatives) need to be made street legal in the U.S. forthwith. For freight equipment, it's a matter of maintenance: lighter locomotives that can develop the same kind of power are easier on the rails and can allow for faster train speeds, improving the industry's competitiveness (and the Aussie examples prove it can be done); and for passenger equipment, a matter of usefulness and accessibility. Better, lighter, faster, safer trains and operations would help make our laggard mass transit world-class once again, especially as things like the Hubbert peak theory work their magic and nonrenewable resources cease to be affordable. We need to see this kind of equipment operational in the U.S. We need to see modern signaling such as ERTMS in the U.S. And we need to see rail geometries at modern standards in the U.S. How can we say we're the best at anything involving trains anymore? Our freight trains are long and slow, and passenger trains heavy and slow. Our rail system is a laughingstock! We need to get rid of the current asinine governmental railroad regulation in favor of something leaner, more international, and more in tune with the UIC. How things should be done. In this image, the Indian Pacific, Australia's premier transcontinental train, using engines and equipment very similar to American norms, passes a Transperth service. Because of Australia's ongoing gauge issues, Western Australia's rail network is dominantly the narrower Cape gauge, while the national network utilizes standard gauge. On either gauge, however, equipment and operating practices are similar to Chinese or American counterparts: those two Indian Pacific locos are essentially GE AC4400CWs in a different bodyshell. 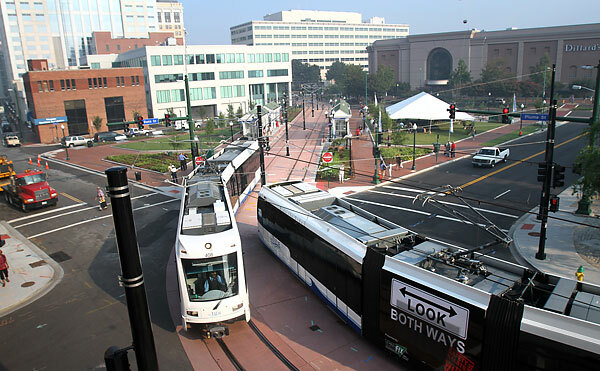 In this image, heavy and light trains are operating safely alongside one another, on the same tracks. That FRA regulations prevent this--speaks volumes about the FRA. Built in 1907 (and extended during the Great Depression), Center City's Market Street tunnel is an example both of the possibilities and the realities of the subway. Originally envisioned as an express subway-local trolley tunnel, the Philadelphia Rapid Transit Corp. (PRT) ran out of money less than halfway through construction from the original 23rd St. portal and was forced to terminate the trolleys at City Hall, resulting in a situation where all subways have to run local east of it, stopping at 13th, 11th, 8th, 5th, and 2nd Streets, while not stopping at all along the axis of postwar skyscraper development along Market west of City Hall. Never a great fit, even in the best of times, the Market-Frankford Line now stops too frequently, particularly in Market East (where two, rather than three, stops are really called for), or not at all, relative to Center City's major employment and retail destinations*. The trolley transfer at 15th is confusing (you have to access the westbound trolley platform, from 15th, via the Broad Street Line platform), and a full subway stop--not just a local trolley stop--at 19th is necessary to capitalize on the strong demand for Penn Center, Logan Square, and Rittenhouse Square access. Fixes for this are, needless to say, expensive. The easiest-to-implement partial "solution" to Market East's too-close-together subway stops is to implement stop-skip service at 11th and 13th, much as occurs elsewhere in the system (particularly on the Frankford Elevated). The free trolley transfer at 13th can also be done at 15th (despite its complexity) and 30th, making it a relatively minor loss if half of the rush-hour trains don't stop there, and the line's stop-skip service has been in use for so long that it's fairly simple just to add an extra "A" and "B" to the map. However--this is still a quick fix, a half-assed solution. And it doesn't remotely address the issue of unmet express-service demand along Market West. To optimize the tunnel, relative to today's use patterns, would require (a) the consolidation of the 11th and 13th Street stations into a single stop**--certainly feasible from a technical standpoint; the tunnel is mirrored on either side by a pedestrian tunnel; and so opening the pedestrian tunnel to the rail tracks at 12th, along with adding some new fare gates and punching an entrance into the former Reading Terminal's basement, along with some barricades along the former 11th and 13th Street platform edges--nothing too fancy, but nothing ugly--along with a fare-gated passage down to the Juniper station, to maintain the free transfer. This costs some money, of course, but is relatively inexpensive--probably about the same as the already-needed-anyway refurbishment of '70s-garish 11th Street Station. Market West, on the opposite side, is much more expensive. There the need is to widen the tunnel approximately 10 feet from the western side of the current 19th Street station down to 20th; and were a new 19th Street trolley station elected to be built, two new platform niches for that, too. Like at 30th, the maximal cross-section for a full stop could be as much as 80 feet (Market is 100 feet wide), requiring significant utilities relocation in an underground that is more like Swiss cheese than schist. Furthermore, a new second-level concourse would need to be bored under the rail tunnel; access to an MFL platform without it is impossible. The most cost-effective solution may be to maintain the current 19th Street carstop with a deep new elevator niche and fare barrier*** and access to the sublevel concourse at its western end^, coupled with a brand-new concourse access at 20th^^. Either way, retrofitting an existing four-track subway for a new express stop cannot be cheap. UPDATE: It occurs to me that this discussion is incomplete without a discussion of 30th Street access improvements. Currently, there is no direct route between the main station and the subway concourse^^^; there used to be one that followed an indirect and winding route, but that has long since been closed, with one entrance being obscured by a pub. An obvious immediate improvement is to cover the (heavily used) pathway between the main station and subway concourse. In the longer term, the major access issues are caused by the layout of the area. There is little space to effect direct access; this, indeed, was the reason the original implementation was winding and circuitous, which led to its lack of safety and eventual closure. The only good spot to extend the underground concourse in such a manner as to create a direct connection with the main (intercity) station is currently occupied by the lower level of 30th Street, a route which is also an access road to the coach yards on the north side of the station. The obvious answer to this conundrum is to open a new access path to the coach yards, allowing this access road to be closed and the concourse extended across it towards a direct station connection. But what if it can't be? Not in the short or medium terms, at least? A good medium-term plan to offer direct main station-to-concourse access at 30th may be to enclose a pathway connecting the main station to the concourse along the side of this quite wide lower level, with a sort of gated ped-road crossing (as an access road, it's lightly used) where the pedestrian access pathway must needs cross the carriageway. Moveable glass fixtures may be used, allowing the pathway to be climate controlled. No matter what the solution is, however, the space must be well lit and securitized. It must be safe and feel safe. Safety (or the perception thereof) was what did the previous connection in, in the end; just as important as solving access issues is the solving of safety issues in the area. * Those actually fronting Market Street, remember. *** Cheaper than a niche for a whole carstop, that's for sure. ^ This setup also has the advantage of making the existing carstop an access concourse for a potential 19th Street subway. The MFL concourse would then terminate in the new line's southbound platform, while the northbound platform would be accessed from the carstop's east end. ^^ This is assuming that the El stop would be built between 19th and 20th Streets. A case can also be made for locating Market West between 18th and 19th Streets, in which case just switch all my "wests" to "easts" and "easts" to "wests" and provision for access to the Penn Center concourse (currently terminating in the BNY Mellon Building at 18th and Market). 19th-20th is more equidistant between 15th and 30th; 18th-19th has better connections access and is slightly closer to the major draws. ^^^ A perception issue as much as anything else. Cities without these sorts of connections just don't quite feel large and worldly--whatever the reality may be. As an example: New York's Grand Central Terminal and Penn Station, Boston's North and South Stations, and D.C.'s Union Station all have these interconnections. Camden and Penn Stations, Baltimore, by contrast, do not. 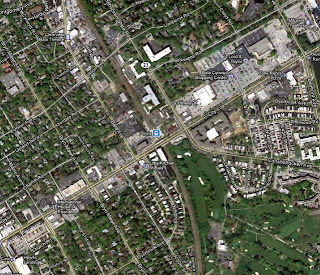 Imagine...you've got a train station right along a busy regional arterial, and clustered around that station are pre-suburban type garden apartments, along with later type office commercial and retail; behind are more single-family homes in three Census tracts with a combined population of 6,928. The station is serviced by one of the most frequent regional rail networks in the country--effectively an S-Bahn type network. You'd think that that station'd get high ridership, right? Even if mass transit ridership was a tenth of the local population, it would still be getting about 693 daily boardings. Even though later development has all been transit-proximate rather than transit-oriented? After all, even with transit-proximate development, ridership does tend to rise. What kind of ridership would you expect from a neighborhood like this? Well, meet Bala Station. All of the things I've just described...but this station has very low ridership, between 92 and 111*. It, in fact, has one of the lowest ridership counts in the system (an older ridership breakdown on Wikipedia shows Bala as having 78 boardings, while Wynnefield Avenue has 90 and Cynwyd 128**). Meanwhile, Overbrook station--also along City Line Avenue, about a mile away and nowhere near the main retail hubs, has a daily ridership of about 770. Why does this station have such low ridership? Two major factors converge, it seems, to undercut Bala's ridership: infrequence and invisibility. Unlike the Paoli/Thorndale Line, which has 87 daily weekday trains (along with 58 on Saturdays and 34 on Sundays), the Cynwyd Line has just 21 daily weekday trains (and none on weekends). These trains are clustered into half-hourly peak service (four trains peak with a fifth train roughly halfway between peaks and a final train an hour after the end of peak)--in short, trains for commuters without regard for any other potential wells of ridership. This infrequence is due in no small part to the brevity of the line; commuter trains once ran all the way up to Norristown along this line, but it duplicated Reading service and was thus curtailed to Ivy Ridge; in the mid-1980s it had the fourth-highest ridership of the Pennsylvania-side lines and was thus paired (as the R6) with the Norristown Reading-side line; and in late 1986 service was curtailed down to Cynwyd due to the Pencoyd Viaduct being deemed structurally unsafe. 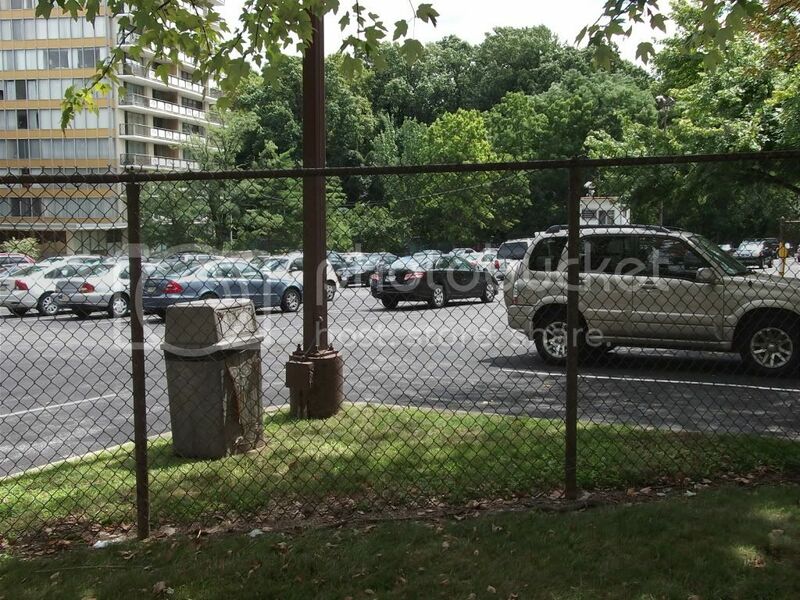 The station's invisibility comes from it being right under the City Line Avenue bridge, with few notable walkways or driveways to the platform; even the station's lollypop*** is hard-to-see, set back a few hundred feet or so along Conshohocken State Road. People who pass by it on an irregular or semi-regular basis cannot see the platform from the road, and so it seems abandoned. Far more damaging than its infrequency (lots of commuter rail operations realize higher per-station ridership on similar schedules) is its invisibility. It's easy to tell when a train's coming when you can see people waiting at the platform (this is pretty certainly a big boost to Cynwyd's ridership); since it appears the PRR sold the former station area a long time ago, the current platform is crowded behind garden apartments, offices, and an abandoned service station. A simple site plan for Bala Station. This abandoned service station can, however, provide the key to making Bala Station more visible once again. Being in disuse for quite some time, it might be able to be qualified as "blighted" and thus begin the process for a taking. With that property, station improvements not dissimilar to this possible site plan might be made. And with the increased ridership from better-designed stations, a case can be made for improving service frequencies--extending them longer and adding bi-hourly Saturday service, say. And building up an improved Cynwyd Line ridership is necessary for getting more ambitious plans rolling. * The most current given ridership of the Cynwyd line is 553, and there are 5 stops on this line. 553/5 = 111. However, a ridership breakdown shows that the bulk of the boardings come from Cynwyd, so that I was moved to consider Cynwyd as offering two stations' worth of ridership (553/6 = 92). The actual ridership count for Bala Station is thus roughly 100. ** (128+90+78)*365=108,040 (annualized ridership), suggesting that these figures are a decade old. Even so, the per-station ridership breakdown is useful. *** Name given to a distinctive type of station sign SEPTA brands its Regional Rail with. 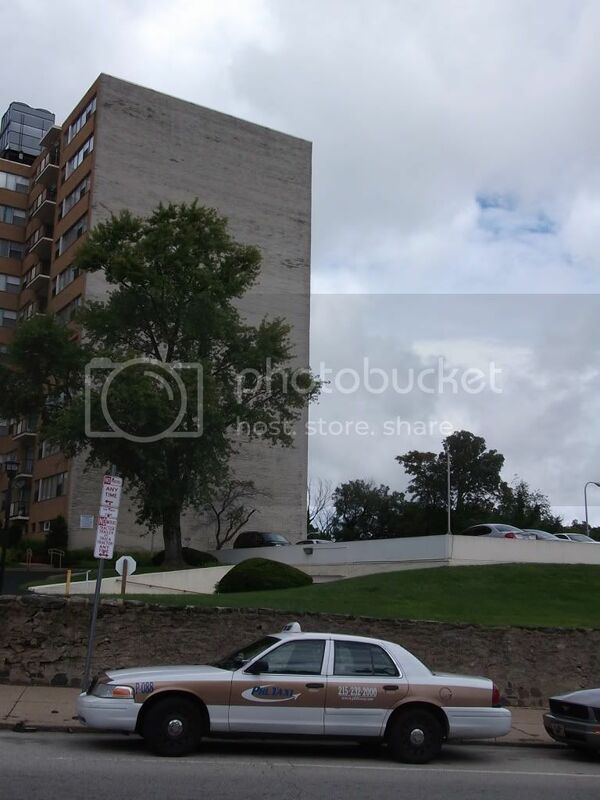 A few days ago, I began this series with a critique of Wynnefield Heights' present conditions. The two major issues the neighborhood suffers from are a lack of interconnectivity and a poor built form. So, for this post, I am looking to make the Heights more interconnected. This is done through (a) a full streets and paths plan and (b) a transportation plan. The streets and paths ("connectivity") plan of course governs where new streets and paths need to be built, while the transportation plan governs how mass transit service runs through the Heights. Wynnefield Heights, as it currently is, is highly disconnected, broken by arterials into a series of superblocks later split into subdivisions and towers-in-parks. 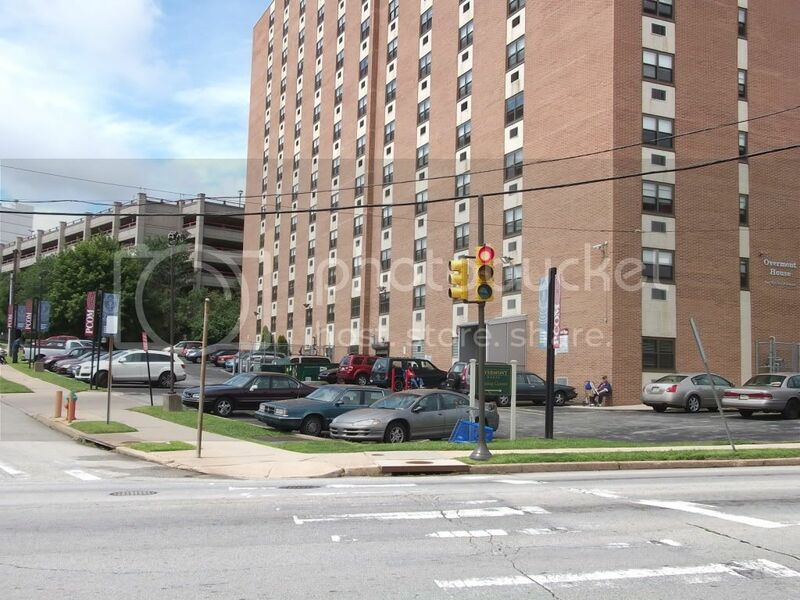 From the five points at the center of Wynnefield Heights, where Monument and Ford Roads and Conshohocken Avenue all meet, no fewer than four of the radiating blocks are superblocks (see Figure A). Two of these are occupied by the mammoth Belmont Filters water plant; one is occupied by a row of towers-in-parks punctuated by a megachurch; and the last, by the Belmont Behavioral Health Center and a large Methodist facility constituting a former orphanage and a major assisted-living center. Figure A: Current Road Network. Note disconnectedness. Assisted-living centers, in fact, pockmark the neighborhood: besides the Methodists' Simpson House, there are also the Salvation Army's Ivy Residence, the Jews' B'rith Shalom and the more nondenominational Park Tower and Bala Nursing and Retirement Center, as well as Inglis House just across Belmont Avenue in Belmont Village. These centers have grounds of varying sizes, yet frequently have to be designed around in order to accommodate the goals of densification and urbanization here by the top of Fairmount Park. Figure B: Road network additions (in red) help cut the superblocks down to size. Two interventions are needed to remedy this situation: the establishment of new streets to break the walls of the superblocks down (Figure B), and the establishment of new paths to interconnect in a non-automotive capacity, particularly into Fairmount Park (Figure C). Road additions, in particular, are engineered to follow the path of least resistance: they follow alignments that either (a) remain in the public realm, (b) run along property lines, or (c) follow existing access roads (particularly in the towers-in-parks) as much as possible. By contrast, trail network additions are engineered to be more picturesque: they wind around the backs of buildings and connect disconnected fragments of the road network, and also provide pedestrian access to both the City Line and Falls bridges, neither of which currently has anything near adequate connectivity for anybody who doesn't drive, and seeks to convert a deep glen in Fairmount Park next to Neill Drive--according to a 1910 topographical map of the park, Roberts Hollow--into a hiking and picnicking area as well as restore former Fairmount Park drives Midvale and Steinberg Avenues to use. 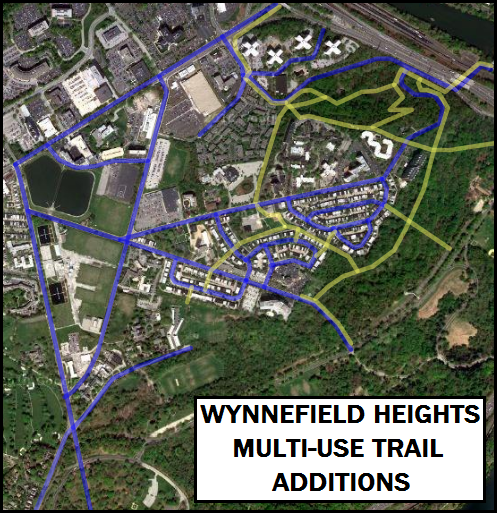 Figure C: Multi-use trails (in yellow) to be added in and around Wynnefield Heights. Both networks intermesh to provide a reasonably high level of neighborhood connectivity (Figure D). While certain curvilinear elements remain in this plan, pedestrian access points now come in the hundreds, rather than thousands, of feet; absurd superblocks are chopped down to size; and active park uses are bought to the section of Fairmount Park which cuts deepest into the neighborhood (i.e. Roberts Hollow). Figure D: Streets and trails intertwine to provide greater interconnectivity. These extensions necessitate an expansion of the public realm in Wynnefield Heights. 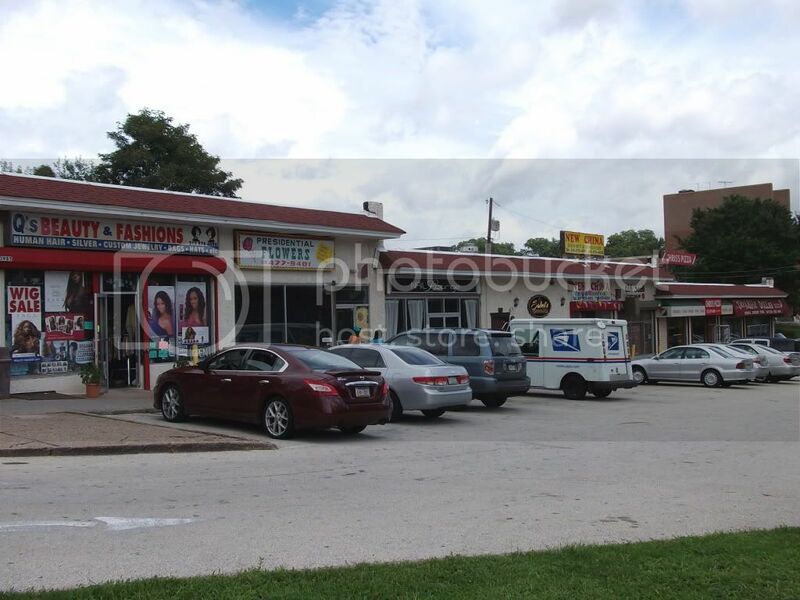 While there has only been one traditional way to extend the public realm--acquisition via eminent domain--in Wynnefield Heights, two other opportunities besides present themselves. These two are simply to build where the property is already public and to work out an agreement by which towers-in-parks allow public access on their already-existing streets in return for alternative compensation--such as density bonuses or a tax break. This latter method is employed as the predominant method to break up the Northern Superblock: instead of using eminent domain and transferring all the necessary private drives to the public realm, eminent domain is used only where major modifications need to be made to offer accessibility, while these public-private agreements--sort of like the City leasing rights to the existing private drive--ensure access into the heart of the superblock. Another issue is the extreme grades from the plateau down to the Schuylkill--a drop of some 200 feet. 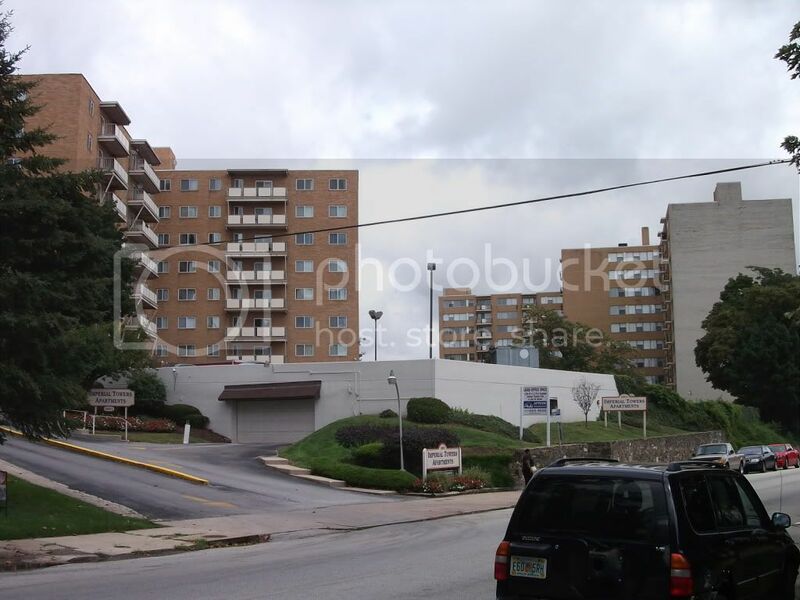 A bridge is planned for over Roberts Hollow between tentatively-named Country Club Road and Neill Drive; this bridge allows a cutoff for people wishing to access eastern Wynnefield Heights without passing through the five points or dropping all the way down Neill Drive and winding all the way back up Conshohocken Avenue. Getting good trail access around this hollow will be tricky. 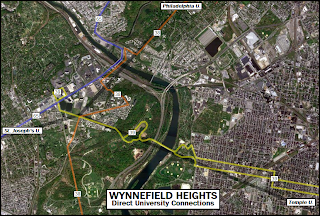 Figure E: Desire lines and proposed mass transit connections between Wynnefield Heights and the three nearest major universities. A large percentage of the occupants of multifamily housing in this neighborhood come from one of these three institutions. Current bus transit in Wynnefield Heights is adequate for most purposes. However, it lacks a few key interconnections--particularly to nearby Philadelphia and Temple Universities. 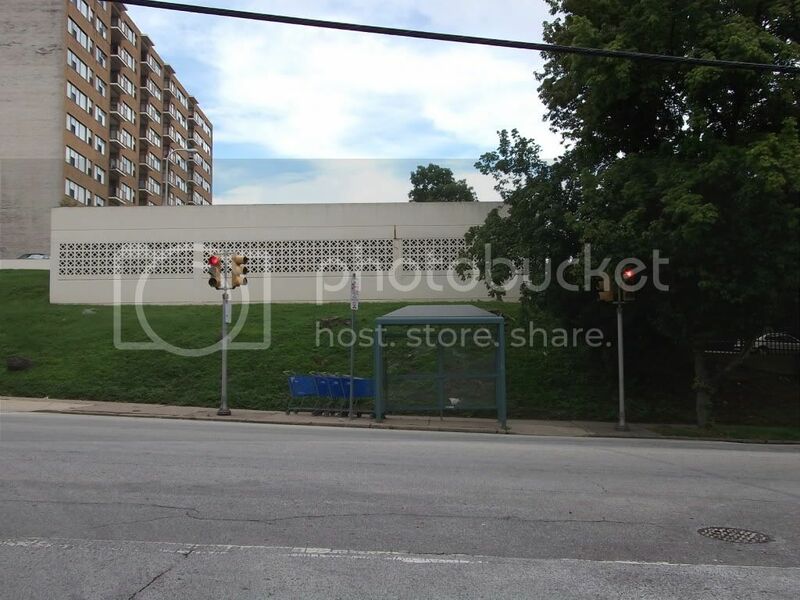 (See Figure E.) Furthermore, this lack of a natural Temple connection, coupled with the lack of a strong bypass of Roberts Hollow, forces the 38 bus to go out of its way and traverse a most circular routing of Wynnefield Heights. 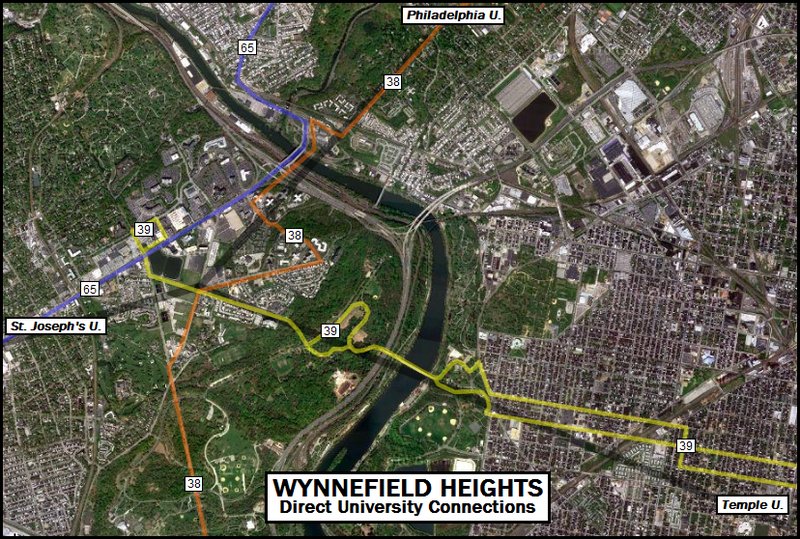 The long-term transportation strategy is, thus, to run an extension of either the 3 or 39 across the Strawberry Mansion Bridge and through Wynnefield Heights, improving Temple University access; and to reroute the 38 via the new cutoff around Roberts Hollow, described above; additionally, instead of heading to Wissahickon Transfer, the 38 would head up Schoolhouse Avenue past Philadelphia University and terminate instead either at Lyceum in Roxborough, Wayne and Chelten in Germantown, or at the Queen Lane Regional Rail station (see Figure F). Figure F: First phase of a transit plan. This network uses the 38, 39, 40, and 65 to access every important Heights location. In the long term, however, consideration must be given to the viability of a light rail line along City Line Avenue; were this to be implemented, the City Line bus patterns would be significantly altered, affecting the Heights tangentially. A bus terminal facility at the corner of Monument and St. Asaph's would replace the overlapping termini loops the 39 and 40 would have in Phase 1. The 40 would either follow Monument straight up, or run along Belmont to Ford, to make this terminus; the 39 would run up Belmont to St. Asaph's and follow that route thence. 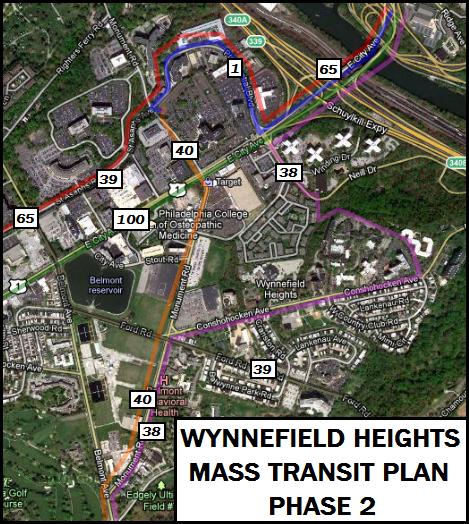 Light rail would make current 1and 65 service west of City Line and Presidential duplicative, and so the 1 would terminate at this new Cynwyd anchor, and the 65 run through it and along St. Asaph's through Bala Village and then back down towards Wynnefield. (See Figure G.) Commuter buses--currently the 44--would of course, however, continue to follow City Line; they do not have the frequency expectations of the light rail, frequent network, or crosstowns. 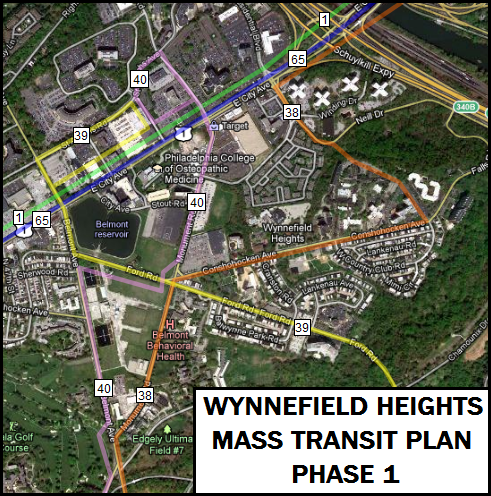 Figure G: A longer-term outlook for Wynnefield Heights transit. On this map, the prospective light rail line is labeled "100". Wynnefield Heights, as it currently is, is a highly disconnected and suburban neighborhood. By improving street and pedestrian interconnections, and by re-examining the bus network, the Heights can be a far more interconnected--and hence urbane--place to live. Next time I will talk about built form modifications in Wynnefield Heights. The Tide light rail opened today. According to the guys at Skyscraper Page it was $350m for 11.4 kilometers (=7.08 miles), or just over $30m/kilometer (=just under $50m/mile). Daily ridership is projected to be 12k-15k initially, which gives us a ridership of 1k-1.3k/kilometer (=1.7k-2.1k/mile). Or, for far more useful calculation: there are 11 stations on the line, which gives us 1.09k-1.36k trips generated per station, or $23k-$29k spent per rider. And of course, since it is in highly urbanized downtown Norfolk, and ridership projections in these United States routinely underproject urban ridership by a factor of half (and routinely overproject suburban ridership by double), we have to refine our numbers to reflect that the real ridership of this line, after five years, will be closer to 25k, which gives us a ridership just under 2.2k/kilometer (=3.5k/mile), or an average station ridership of 2.27k, or an initialization cost of $14k/passenger. The Tide is an electrified light rail line using Siemens S70s and substantial street running. I am certain there's an American premium tacked onto the S70 price (although it should be no more than the per-unit cost of e.g. Portland's or Houston's S70 orders*), but the overall costs seem extremely low, by American standards, and thus very reasonable, by global standards. One last note: The Tide's current routing has two obvious extensions. The shorter, but possibly more expensive, and definitely generating higher ridership, is further north, past Old Dominion University to the Norfolk Naval Station, presumably mostly along VA 337. The longer and cheaper--but given the suburban terrain, less likely to generate higher ridership--follows what is apparently an old rail grade the current light rail line picks up between Harbor Park and Norfolk State University stations; this easement is a straight shot east from the current Newtown Road terminus all the way to Virginia Beach's beach. In the long run, this extended Tide route would work best paired with another line running at least from Norfolk International Airport--preferably the Lynnhaven Roads, if not Fort Story--down to at least the Norfolk Naval Shipyard, if not Deep Creek, and a third line that would originate at the Chesapeake Square Mall, run through downtown Portsmouth with some interlining with the second line, and branch northwest to Churchland (first the shopping center, and then the Coast Guard base) and/or northeast to Virginia Wesleyan College and/or the international airport (possibly interlined with the second line). A final possibility to be considered is a line down the Virginia Beach spine, connecting with the second line up at Ft. Story and the first line just south of downtown Virginia Beach, and running down to Landstown via Virgina Beach Municipal Center with a possible branch to Sandbridge Beach via the Training Support Center; no route has been considered to Newport News, due to the inordinate expense of a cross-Roads connection. In all, though, the Hampton Roads are a classically "New South" metropolitan area--almost pure sprawl--and so any any further quality transit in the area is going to either have to take on the goal of densifying near itself or else surrounding itself with insurmountable park-and-rides. Whatever the folks in Norfolk are doing right, it would make sense for other transit agencies to follow. * If the Wikipedia numbers are to be trusted, it will cost Atlanta $17.2m for four units. That would make the cost per unit $4.3m, implying that the Tide order (nine units) must have been roughly $38.7m (or just over 1/10 the total cost). 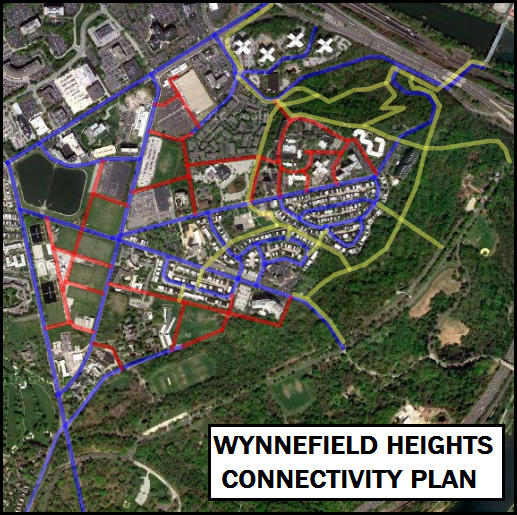 With a recent surge of energy I've been once again working on my portfolio plan for Wynnefield Heights. Developed mainly during the period 1955-1965, the Heights is an exemplar of postwar scientistic planning--that is, very poorly planned indeed. The neighborhood is defined by towers-in-parks and airlites studded in a series of superblocks: one, which I call the North Superblock, extending from City Line all the way down to Conshohocken, and from Monument all the way over to Presidential Boulevard/Neill Drive/Fairmount Park boundaries; the second South Superblock from Ford Road down to the park and Edgely Avenue, and thence over to Monument (with the exception of Balwynne Park Drive); and the last two being the massive Belmont reservoir and filters plant. Even in the extremely small part of the neighborhood not defined by these immense superblocks and monolithic developments, a disconnected, hierarchical, overbuilt, autocentric street system holds sway. There is no way from Lankenau Road to Lankenau Avenue, for instance, without going all the way to Conshohocken Avenue. Even in the relatively few locales (especially given the proximity to Fairmount Park) in the neighborhood where the tower-in-a-park development type is relatively suitable (out-of-the-way, not contributing to excessive superblock typology), such as the development I currently reside in, there is a patina of underbuilt-ness. 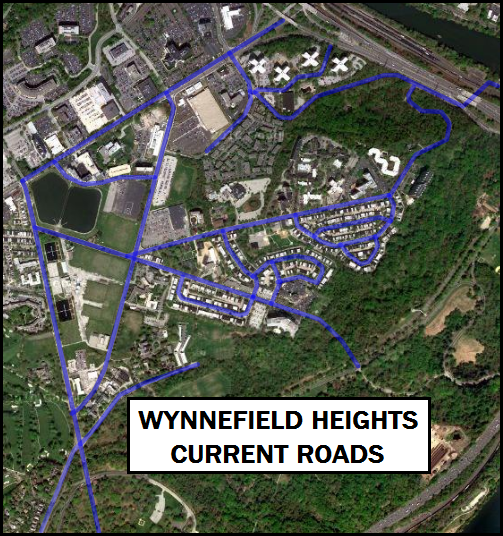 Wynnefield Heights is, in short, not densely enough built. As midcentury planning writ large, it offers the strongest proof possible that "scientistic" planning was--and is--antiurban planning. 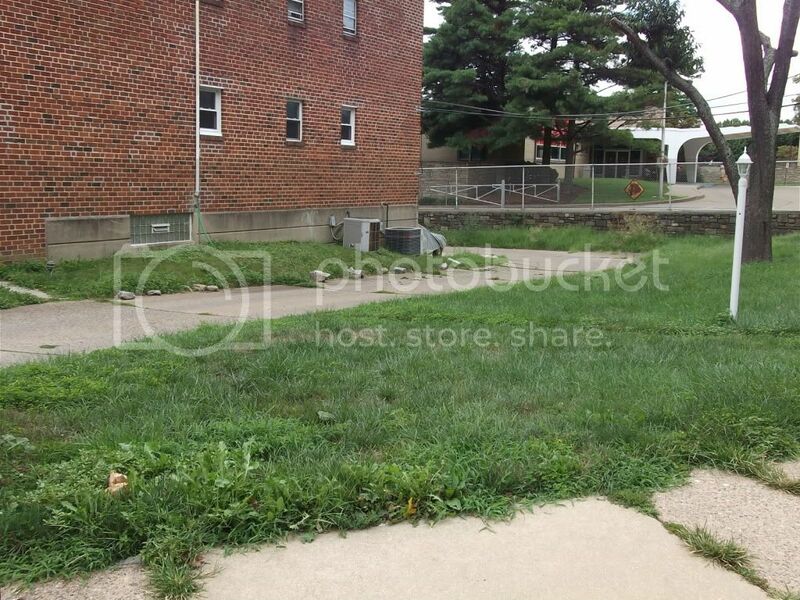 For, despite being in a city, Wynnefield Heights is just that--antiurban. The end of Presidential Boulevard, for example, happens to be a dead end at a slightly different grade than the Target entrance road. The current infrastructure is so bad that, as you can see by the second picture, drivers have actually pushed their own desire line clean across the grass. A T-road or crossroad should be called for here, as the easement for 40th Street meets Presidential/the access road here as well: this easement, as can be seen in the third picture, is basically jungle. 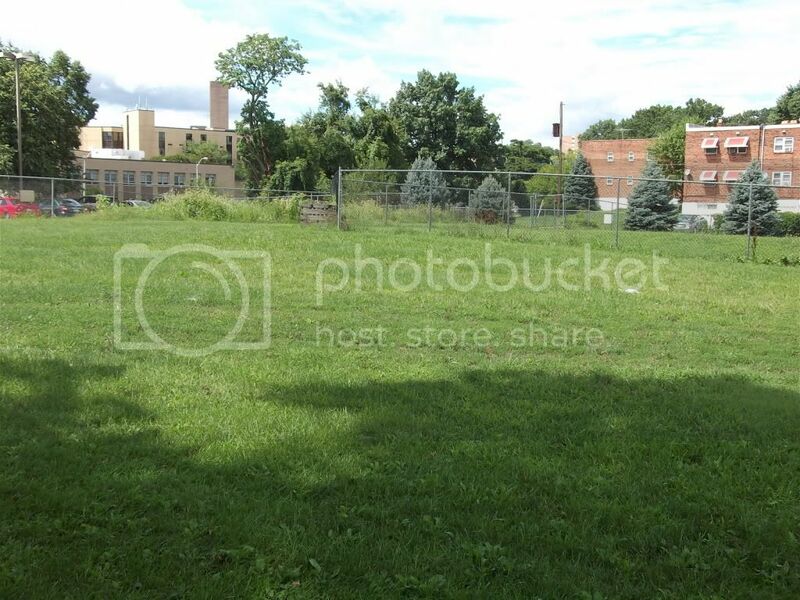 Furthermore, the sloping lawn along the side of the Target is 100 feet deep at all points--well and truly deep enough to provide some townhouses facing Presidential, across the street from the garden city Lincoln Green development. Strangely enough, while there is no vehicular connection here, there is a sidewalk connection. Despite the obvious lack of maintenance on it, it is heavily--and frequently--used by pedestrians from Presidential City and Lincoln Green looking to access the nearby Pathmark. Once I even saw a State Trooper riding down it! This sidewalk connection is the southernmost point of substantive pedestrian permeability of this superblock. 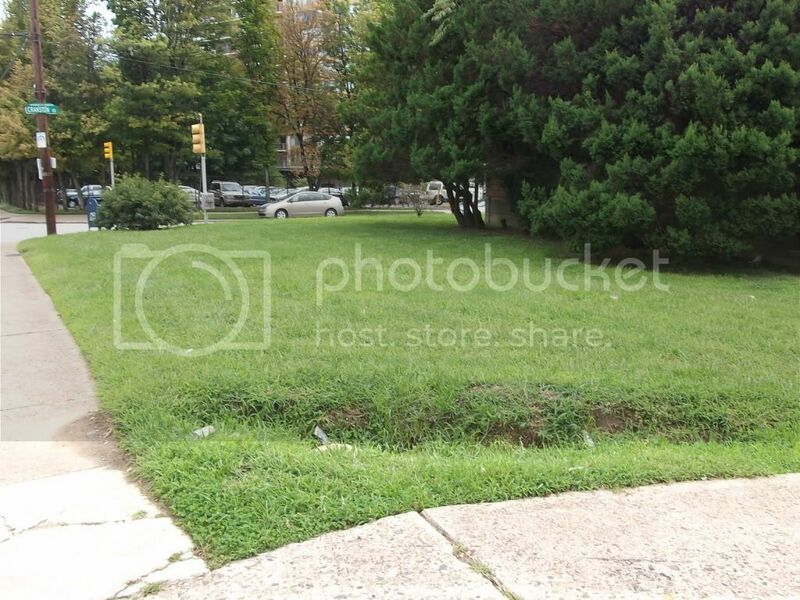 This mowed field is, in fact, the bed of Woodbine Avenue. 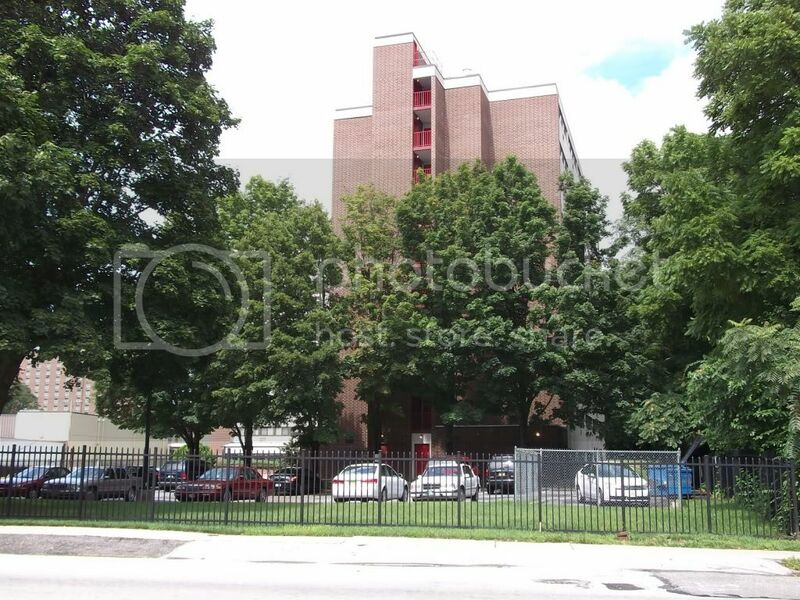 Woodbine here is inaccessible save through a small apartment complex from Edgely Avenue, presumably run by the Methodists, and one I learned upon egress is supposed to be gated. In theory, access to this section of Woodbine would be effected via the former bed of 41st Street--but that easement has also been fenced off, possibly illegally, by a transmission tower right next door. 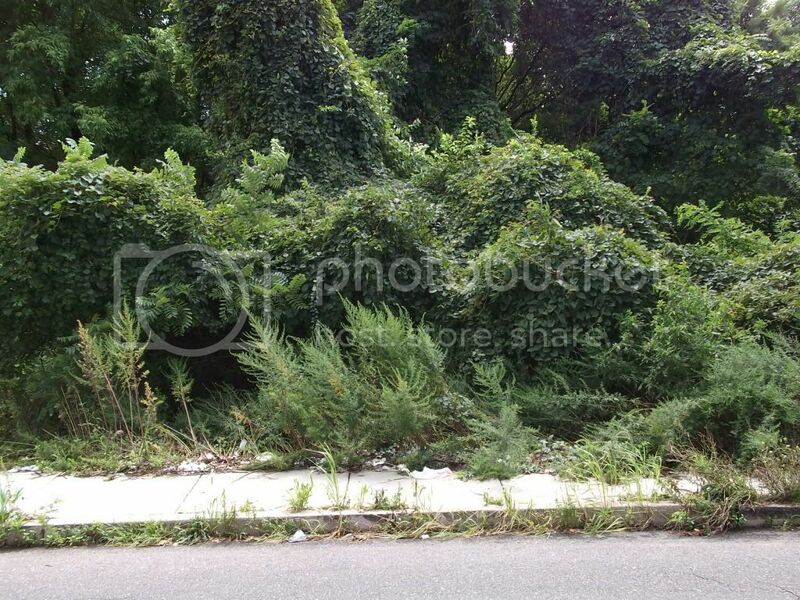 The sum effect of all this is that there is a substantial area of public right-of-way unavailable to public use. 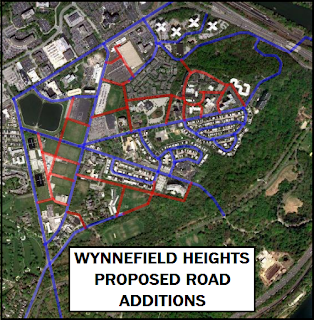 This is a catalog of several Wynnefield Heights towers-in-parks, most of them along Conshohocken Avenue. These developments are almost uniformly never built to a high degree of density, despite their verticality, and instead sit on small pads in the middle of the plot wreathed by parking lot. Space that would be good for townhouses, townhouse-style apartments or condos, annexes, wings, or even whole new buildings is instead used for--parking! 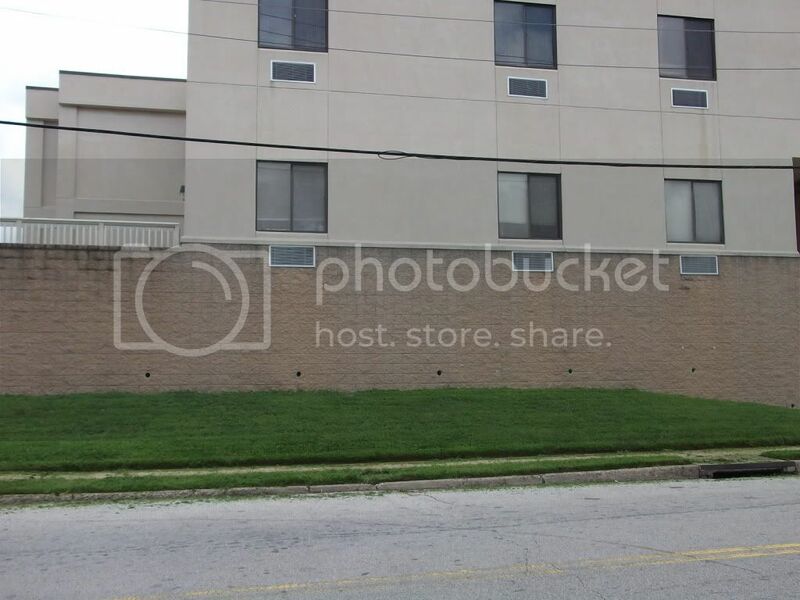 And to make it worse, in two locations the complex presents prime streetside land blank walls, at least one of which is for a parking garage. 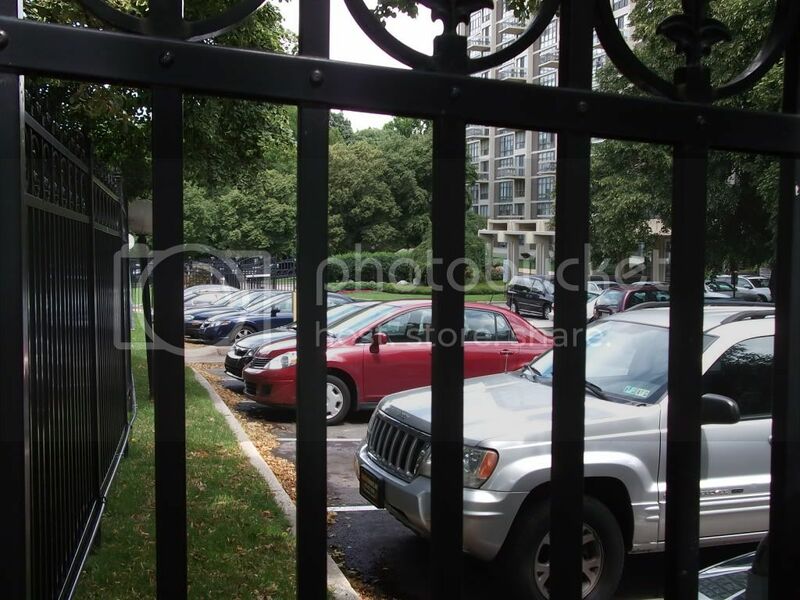 Also note these developments are all gated. For pedestrians, it is like a cattle chute: you're herded onto Conshohocken Avenue or Ford Road. Frankly, the only part of the whole area that doesn't feel grotesquely underbuilt is the development along Country Club Road, built to the same dimensions as Belmont Village but with more Modernist architecture, and where, at 50 feet, some of Wynnefield Heights' narrowest roads reside. Since these two issues make up the substance of my complaint about Wynnefield Heights, my plan for it must obviously (a) improve connections for all modes but principally for pedestrians (and cyclists), and (b) promote densification. So--more roads and upzoning. These two issues will be explored (hopefully) soon. *This when the relevant zoning, R10, doesn't prescribe any setbacks. I stand corrected. The relevant zoning is R9, which requires a 9-foot front and back setbacks. Even so, the setbacks along Ford exceed zoning by an excessive amount. The Cynwyd Trail is seriously overdesigned. Don't believe me? Check out these pictures I snapped last week. The former Cynwyd Train Station. Now vacant, plans are to restore it. The beginning of the trail at Cynwyd station. 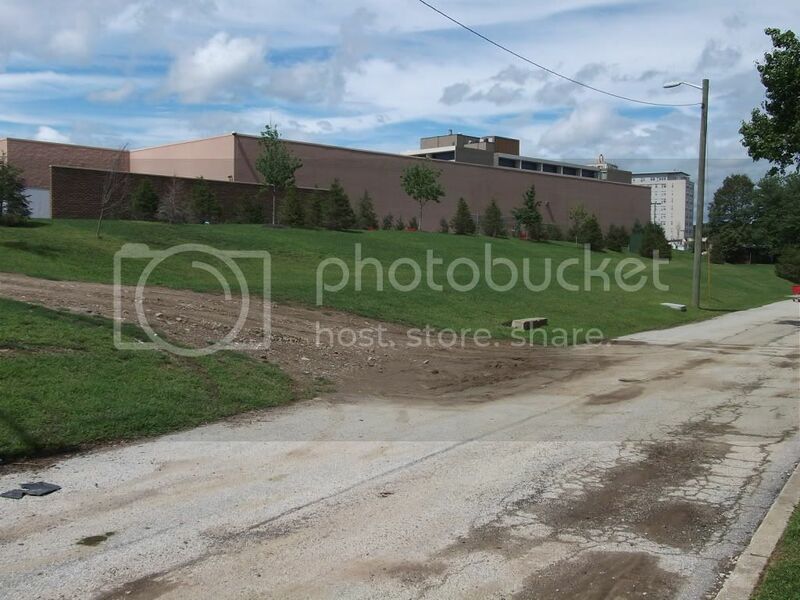 Notice (a) track on left and (b) paved trail does not (yet?) meet the former outbound platform. Trail grading just north of Cynwyd. To the right: crushed-gravel "local" trail, on top of tarp, on top of scraped-down roadbed; on left, roadbed-and-soil base for asphalt "express" trail. Both trails are 12 feet wide. Here the layer of dirt has yet to be added, and the roadbed on the express trail side is raw. A run, seen from the trail. All that's left of the final utilized incarnation of Barmouth station, a semicircular amphitheatrical seating area. Trail plan. Notice how paved trail seems to be (mostly) following trackbed, while gravel trail meanders more. Here, the gravel trail splits off to follow Veil Creek, while the paved trail remains in the roadbed. The paved trail, too, runs away from the roadbed. The gravel trail connects to this ancient bridge to Westminster Cemetery. Dirt and plantings occupy part of the roadbed here. Gravel and paved trails right next to each other. Remember, this completely fills a formerly double-tracked line! Landscaping features along gravel trail by entrance to Pencoyd Viaduct. The trail diverges here: to the left, the Switchback path descends back down to Belmont Avenue by Belmont Hills and (what's left of) West Manayunk; to the right, the trail will connect to an extension across the Pencoyd Viaduct. The switchback path, heading down the hill behind Westminster Cemetery. Looking at Pencoyd's approach span from the switchback path. 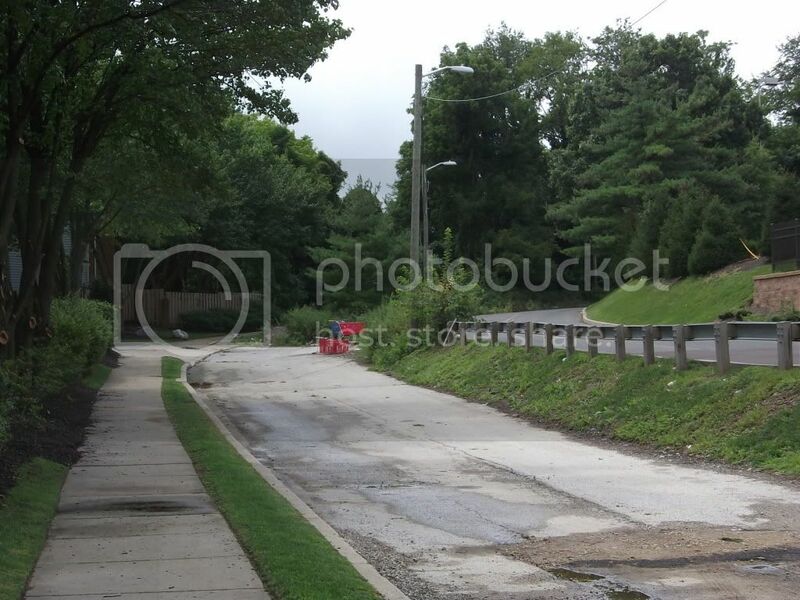 The switchback path runs down a gentle grade and connects to Belmont Avenue by the entrance to the village of Belmont Hills. The key observation is: it's too wide. A much smarter plan would have been to set aside one track for future reactivation--despite the fact that SEPTA has never had an expansionary corporate culture--and to run either the gravel or the tarmac path down it. The other, reserved, track space could then be reactivated at any time in the future. This is what I had feared would happen back in 2009 when I first spoke about a service restart to (at least) the Schuylkill Expressway being more important on this route than just a trail. 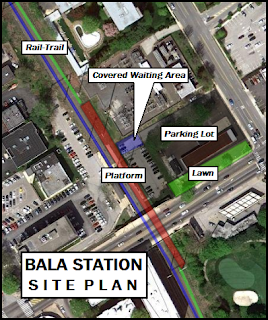 Granted, there's still space for a trail, but since SEPTA proffered no request for reserved railroad right-of-way in the general easement, overzealous landscape designers did not factor that eventuality in. Had SEPTA (or possibly PennDOT*) been more prudent, a reserved ROW might have been worked into a park design, instead of the park needing to be redesigned when (if) SEPTA decides to actually start expanding its system. Renovating Pencoyd might be a tad expensive, but there's certainly no harm in extending to Barmouth (barely any operating expenses increase), especially now that the former station (once again) has public access, and there is a small jobs center right where Belmont Avenue crosses the rail line. Furthermore, Lower Merion has decided to turn everything where the rail line passes the Schuylkill Expressway into a park; this makes any further infrastructure investment in the area that much more difficult (and expensive). Frankly, the overelaborately-landscaped Cynwyd Trail is more a boondoggle now, because of the lack of planning for rail restoration, than it would have been were rail restoration seriously considered. It is a boondoggle since it cost a lot to build now, and since it'll cost a lot to unbuild when the need to extend the rail line makes itself apparent. The only consolation seems to be that it looks like the paved trail will be retaining enough of the old roadbed that it won't have to be rebuilt from scratch. The macadam may--just may--be a sealed railbank. But that is a fragile hope in the face of depressing built organizational incompetence. * Maryland's DOT apparently has control over several abandoned RR ROWs in the eventuality MARC decides to expand its commuter service.